I say this with the utmost love, but seriously…cats are just the WORST during Christmas. It’s almost time to trim the tree again and I’m still finding rogue ornaments that my two fluffy fiends liberated from the living room last year. Video via Dans Ta Pub. This entry was posted in Commercials, Ornaments and tagged cats, chewing, christmas, climbing, commercial, mischief, tree. 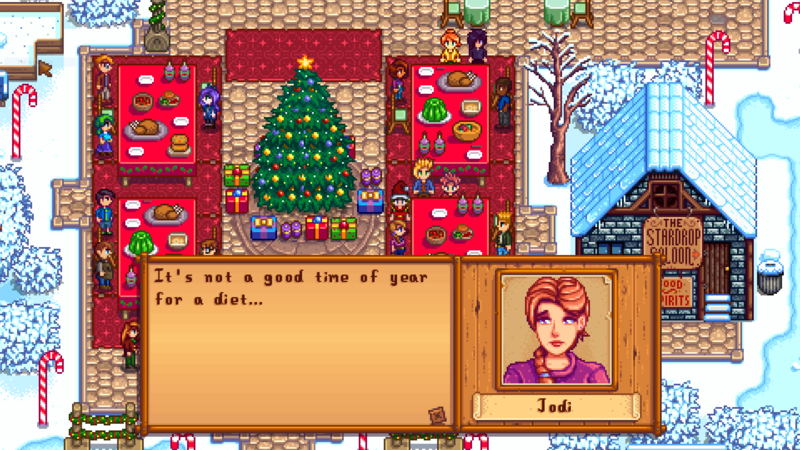 I talked about my love for the video game Stardew Valley (and it’s inherent foodie friendliness) on my other blog back in April. It’s now almost August and I’m STILL playing. 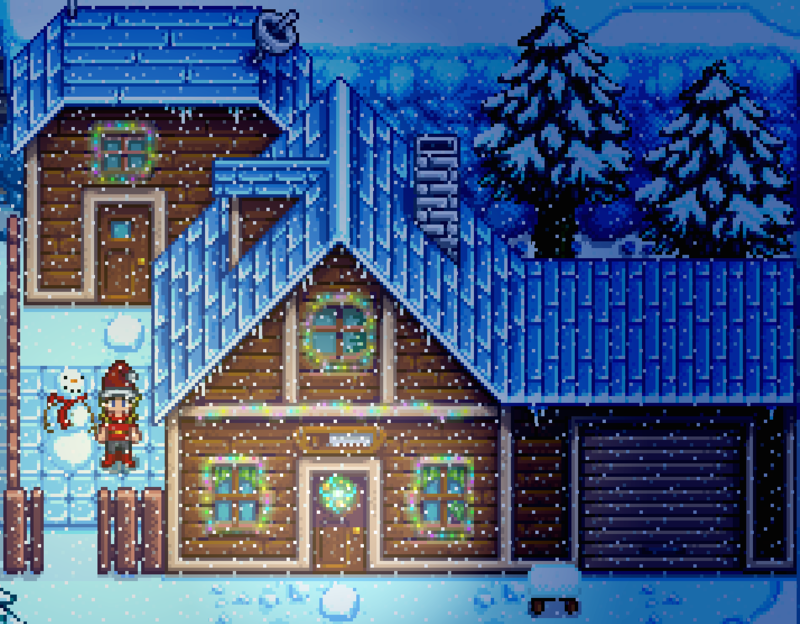 Not quite as much as when I first started but I did just celebrate my 4th Christmas in game. OK. It’s not actually called Christmas. The official title of the holiday is The Feast of the Winter Star, but as you’ll see, it bares a very strong resemblance to the most wonderful day of the year. As I sit in my 80+ degrees office at 11:00 AM in July, I can’t help but be a little nostalgic for the threat of snow and the prospect of mittens. Stardew Valley doesn’t disappoint in this respect. 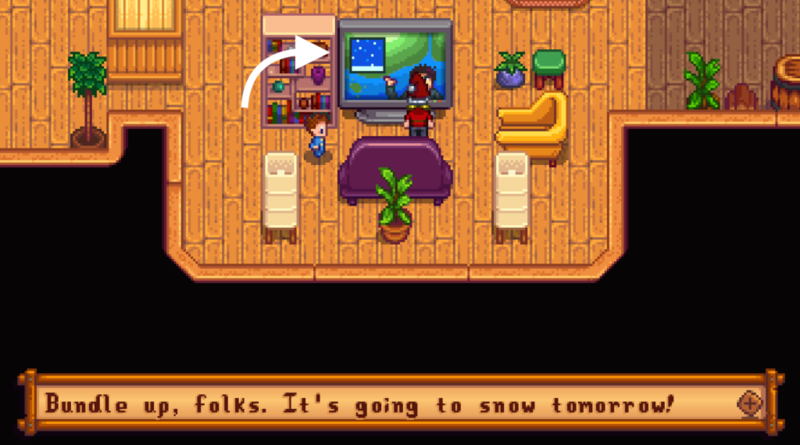 As soon as I wake up in the game I check the forecast and always get a little excited when the weather man announces an upcoming storm. The snowstorms in this game are absolutely mesmerizing! 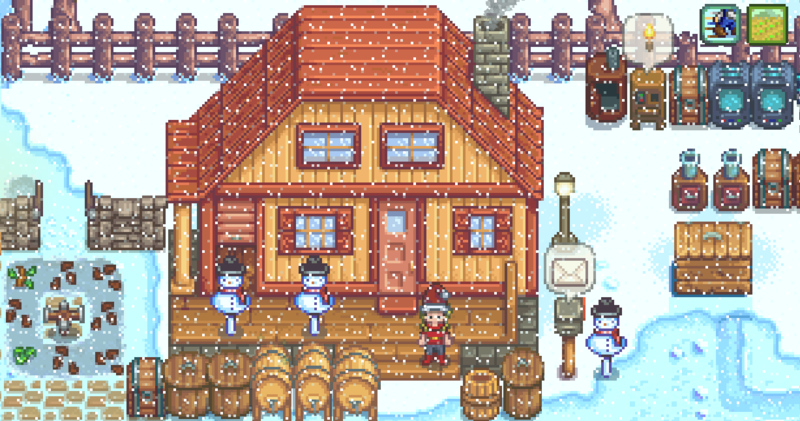 Twitter user @kirin87 made this animated gif of snowfall in the game and I think you’ll agree that it has a rather hypnotic effect. 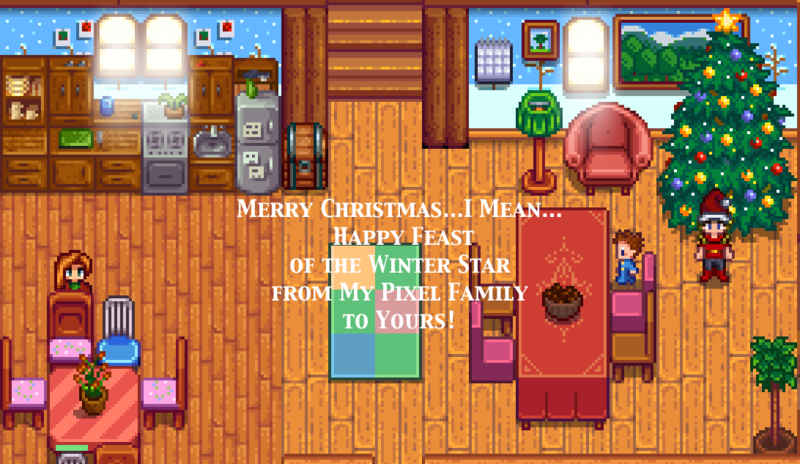 The winter season of Stardew Valley is by far my favorite. The music, the landscape, the lack of usual farm frenzy all combine to create a very quiet environment. It’s tremendously relaxing. 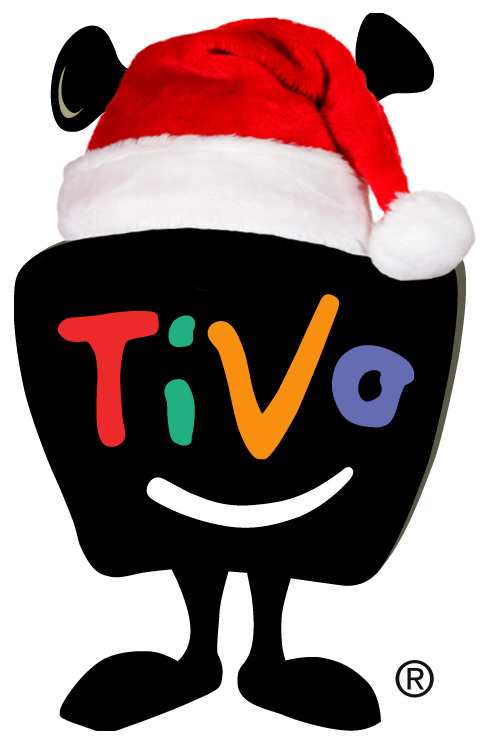 To really get in the spirit of the holiday season I like to sport a little red ensemble and a jaunty Santa hat. 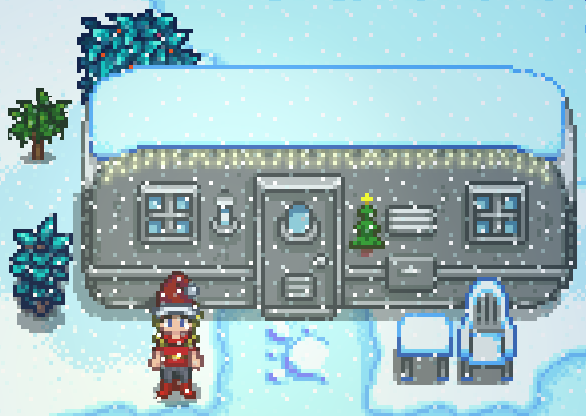 As you can see, I’ve also begun decorating my house. It’s not exactly up to Clark W. Griswold standards but it will do for now. 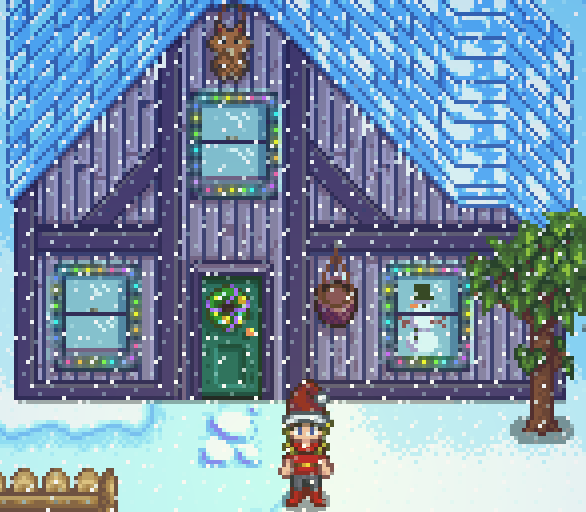 I hope that in the next game update the creator will add more decorative options because I have serious deck the halls envy when I walk around town and see all of the other houses sporting wreaths and lights and all manner of sparkly touches. Leah has candy canes. 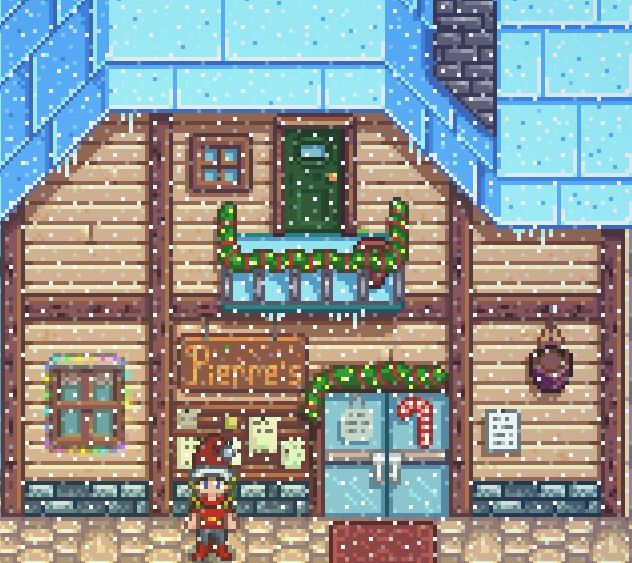 Pierre’s store is festooned with garland. Penny & Pam’s trailer has oodles of twinkly lights. Grandma Evelyn’s rainbow theme is completely on point. 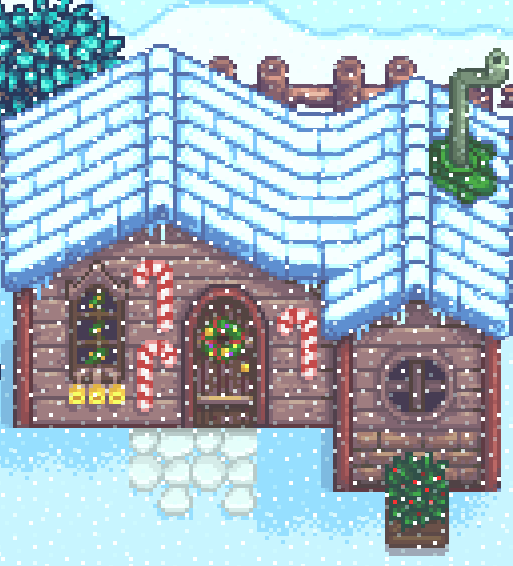 Then we have Robin’s house. I assume she’d win the decorating contest if there was one. What an overachiever. Hmm…maybe that activity should be added to the game! Dear Concerned Ape please take note. 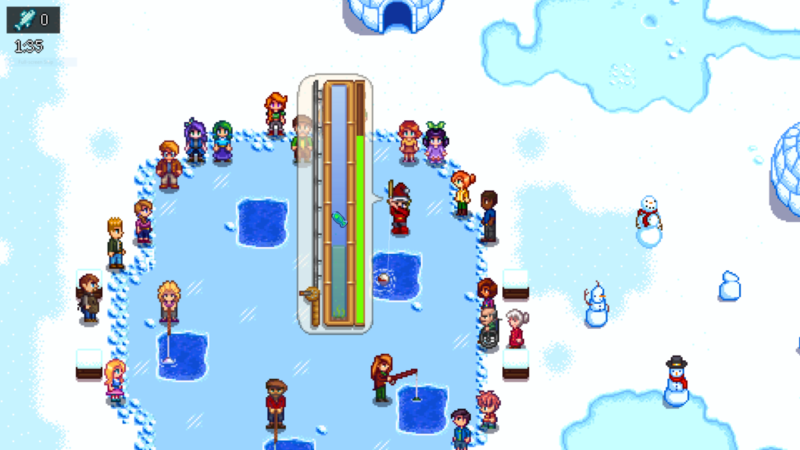 During Stardew Valley’s winter there are two special events that take place. One is the Festival of Ice. The big moment of the day is a fishing contest which I usually win, now that I finally understand how to fish, go me! The other takes place on Winter 25 (aka The Feast of the Winter Star). 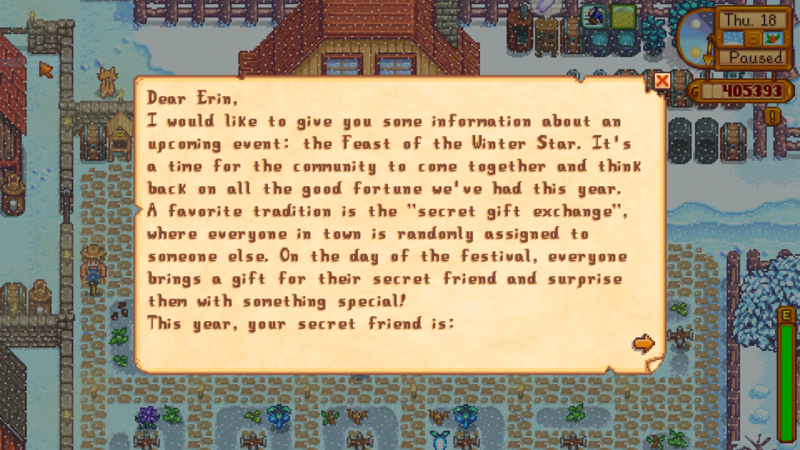 At some point in the month you’ll receive a letter from the mayor letting you know who your secret santa will be. Your job is to bring that particular townsperson their favorite thing. In return they usually give you complete garbage but I suppose it’s the thought that counts. My first year playing reigning mean girl, Haley, gave me a glow ring which is awesome and let’s you see in the dark so you don’t run into trees at night and get lost in overgrown forests. After that, various townspeople have given me shells, sticks of wood, and rocks. Umm…yay? Rumor has it there’s a slim chance you’ll get a tea set. I’m holding out a little hope that this will happen. 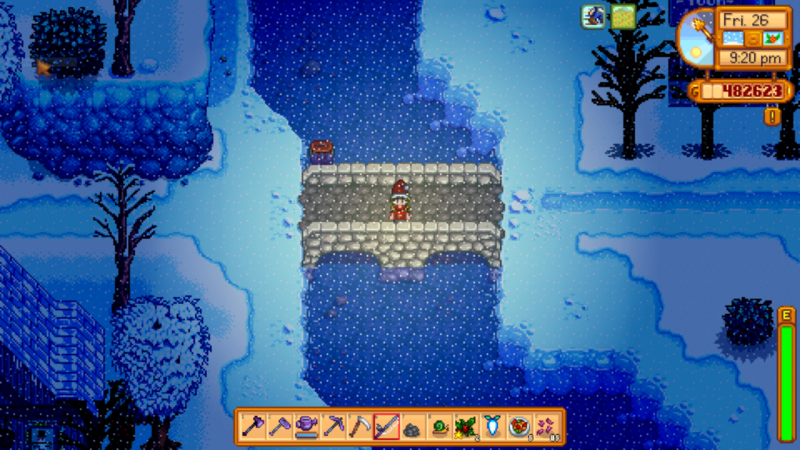 During Winter 25, the downtown area of Stardew Valley is extremely pixel pretty. There’s a huge, lovely tree and everyone gathers to share a feast. 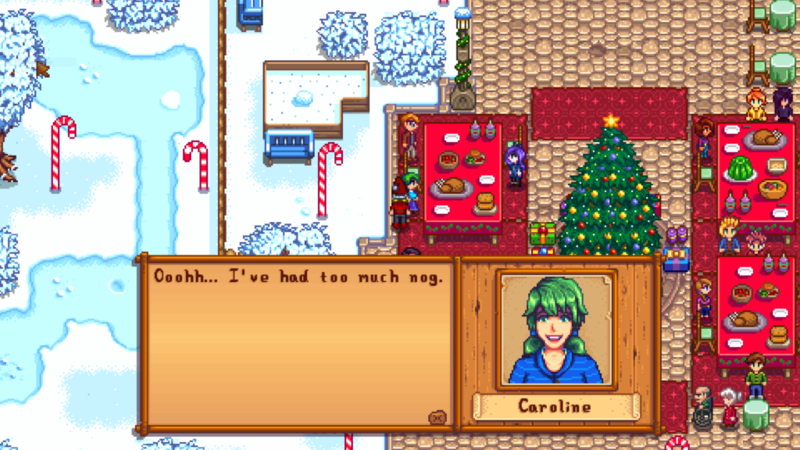 However, just like real life holidays, Stardew Valley keeps it real. 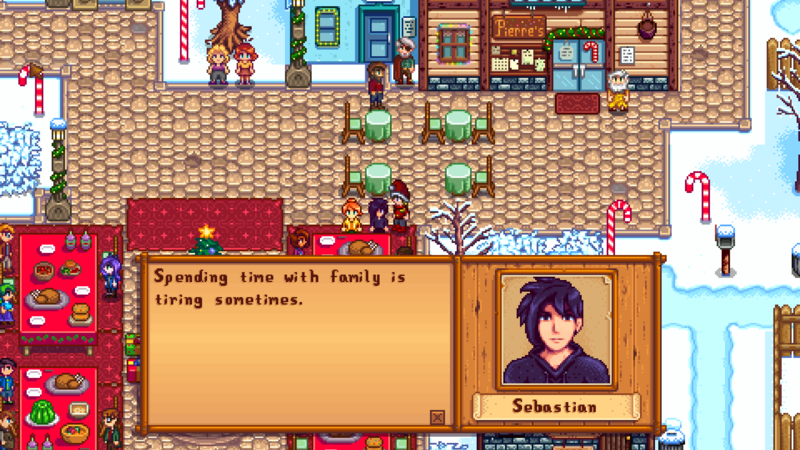 Moody Sebastian is annoyed with his family. Someone drinks way too much. 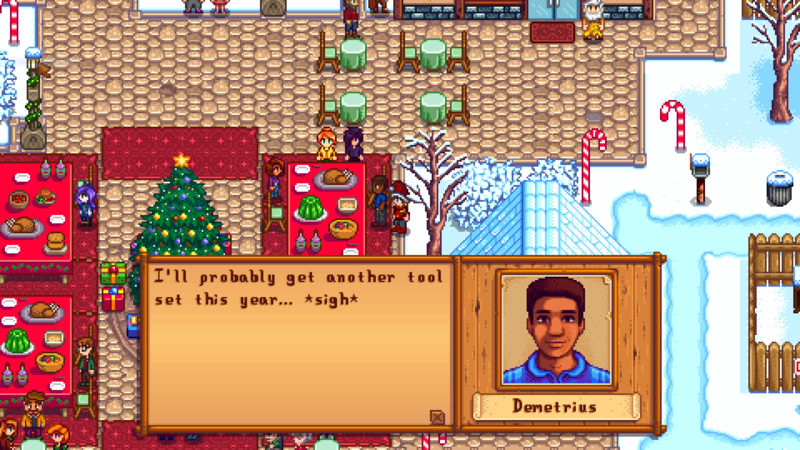 Dad Demetrius already knows he’s just getting another tool from his unimaginative family (at least it isn’t a rock…) be grateful, dude! People worry about eating too much. To which I say, chill out Jodi! You’ll be back at step class with all the ladies on Tuesday. Which also means that none of you will be in your respective shops and homes when I need something. I’m not bitter about that at all. Nope. After all that holiday drama it’s no wonder I’m having an It’s a Wonderful Life moment on a bridge…I kid! I kid! I just like standing around in the snow. 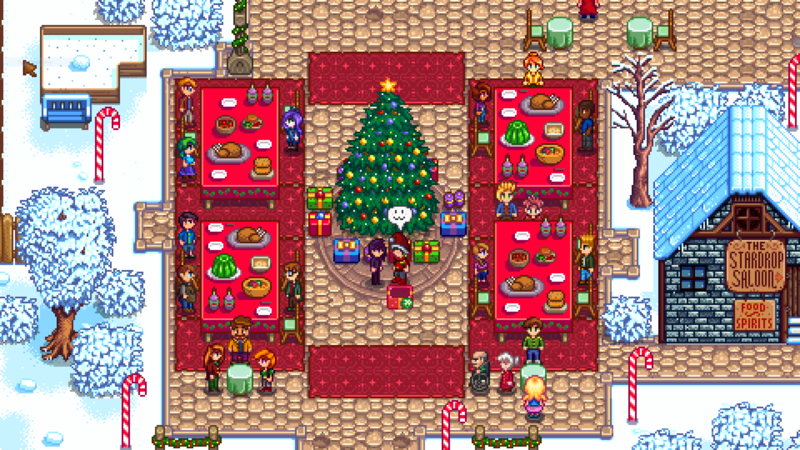 This entry was posted in Games & Apps and tagged christmas, feast of the winter star, gaming, relaxing, snow, stardew valley, video game, winter. Hey! 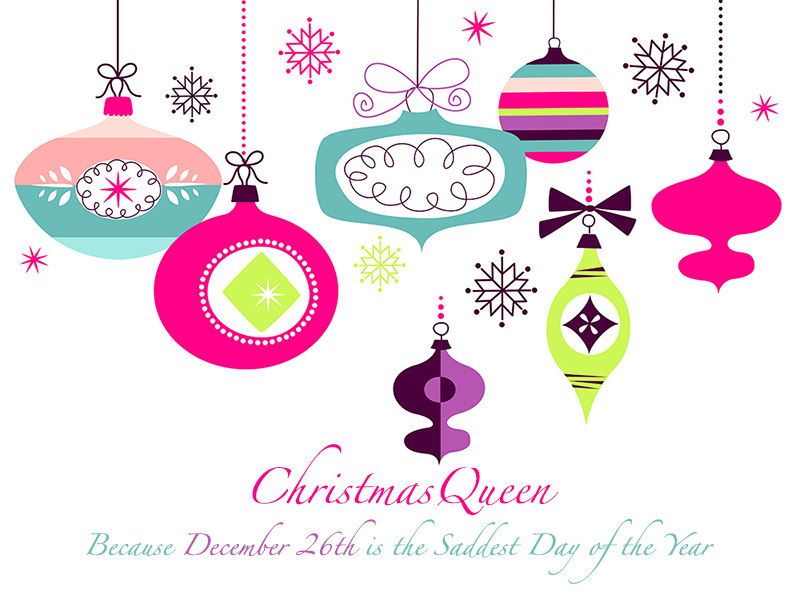 My friend, Muara, is a fellow Christmas Queen too and she’ll also be contributing her holiday traditions, tips, and faves here as well. Her iPhone case list below is a fabulous idea. Why didn’t I think of that? Welcome, Maura! This has been my case for the past couple of Decembers. I’m a sucker for anything having to do with strings of Christmas lights. Reindeer, snowflakes, and trees in a Fair Isle pattern. There are some excellent, similar options as well. These cute snowflakes and mittens would work well into February. 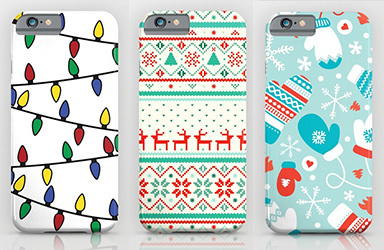 This entry was posted in Accessories and tagged accessories, case, christmas, decorate, iphone, tech. Hindsight: All I Want For Christmas Is You (Note: I’m SO excited for this one. I LOVE this show). Synopsis: Lolly wants to get over Kevin by throwing a party; Thermal’s release is a success; Kevin does something that may force history to repeat itself. Synopsis: Five years into the future Uncle Phil tells Nicky about his Christmas christening. Guest stars Boyz II Men. Synopsis: After a shooting party at a castle in Northumberland, the Crawleys return to Downton for the Christmas holiday. Synopsis: Leonard and Wolowitz clash over a work emergency; Amy throws a Victorian Christmas party which Sheldon resents. Synopsis: This clever tale of Bridget Jones’s odyssey from Mr. Right-here-right-now to Mr. Right delivers a glimpse into the inner workings of the female mind. Note: While not a “traditional Christmas” film, I watch this movie every Christmas and there’s plenty of holiday scenes bookending the storyline. Plus, who doesn’t love Mr. Darcy’s reindeer jumper. This entry was posted in Television and tagged big bang theory, bridget jones, christmas, downton abbey, episodes, fresh prince of bel-air, hindsight, listings, tv.